For decades the animal rights movement has worked to define those working in animal research as “monsters” and “murderers” who only look to harm the animals we work with and don’t care about their welfare. The reality, however, is very different. In fact, as someone who works in animal research, animal welfare is extremely important both to me personally and to the results obtained from the studies. Animal welfare is a collaboration between the animal caretakers who are in the rooms changing cages every day, myself as the veterinary technician on the veterinary staff and the investigators doing the research. Our rodent cages are provided with nesting squares that the mice can chew up to simulate the natural behavior of building a nest. Plastic houses can be used as a cage enrichment device although careful attention must be paid to ensure that fighting for the house doesn’t occur. When there are swine in the facility, I have found that providing them with plastic balls that can be filled half way with water is something they particularly enjoy. These balls then roll in random directions and give the pigs something to push around with their nose. An older alternative was to provide bowling balls but this could cause considerable damage to the room floors as the pigs would roll them up the wall and let them drop. Previously I had also tried deflated basketballs thinking they would like to carry them around but the pigs didn’t seem particularly interested. The plastic balls, on the other hand, were a huge hit! Animal welfare is not limited to just cage enrichment. It’s the whole process from effectively washing the cages and bottles to provide a clean habitat, to handling the animals gently to prevent injury and stress. It means adequately training the personnel in techniques and to teach update techniques as they become available. I often provide training to new grad students and laboratory technicians in the proper way to restrain their animals and the common methods of injections and sample collection. I’m at the disposal of any of the labs should they ever need training in a new technique or a refresher on something they haven’t done in awhile. Finally it means providing veterinary oversight to make sure the animals are being housed and treated according to the regulations and to provide health care when needed. Several times a week I’ll go through our various facilities spread out across campus and check in with the caretakers to see if there are any problems I should be aware of or information that needs to be passed along. Working with laboratory animals is a responsibility that I take very seriously; ensuring that the animals are treated humanely and that the research never becomes more important than the animal. 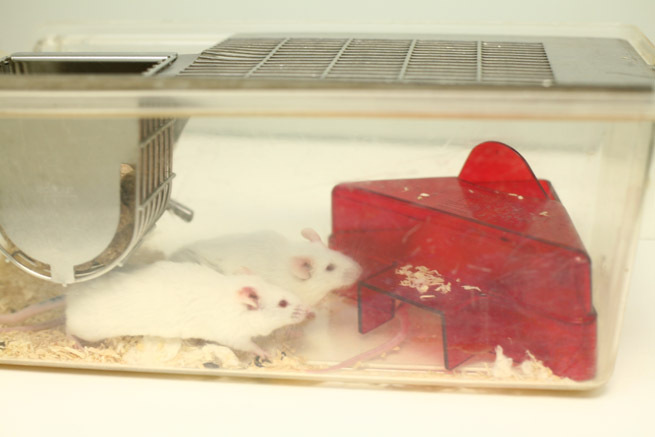 Posted on March 12, 2009 May 10, 2016 by EditorPosted in Campus Activism, News, Science NewsTagged animal care, animal research, animal welfare, cages, Dave bienus, enrichment, houses, housing, mice, penn state, swine, vet tech, veterinary technician. I can understand animal research but why is animal agriculture important? Except for those few who have allergies(severe form of hayfever) animal agriculture provides little to no benefits for mankind other than a few briefs moments of eating something that will cause further problems. (Red Meat == bad, yet another research comes out about that, processed meat too). So why is animal research to improve human lives good and animal agriculture research to give detriment to human lives also good? Animals in research are very important to save human life. Thank you for what you do. I am a family farmer from Iowa, and HSUS has us in their sites as well. Farmers take great pride in caring for their animals as well. We raise pigs and all of our pigs are housed indoors. My sows are in individual stalls for their protection as well as mine. Barns and rooms are cleaned and disinfected between groups. Rooms are kept between 65 and 70 degrees even during the cold Iowa winters. Sows get fed a balanced diet that a nutritionist develops for us, and the animals always have access to fresh water. All animals are checked twice per day and sick animals are given treatments to get them better. We have a veterinarian on call to help at any time. Livestock is important to the economy in Iowa. HSUS would like to eliminate animal agriculture and have us all become vegans. Family farmers are proud of the fact that we produce healthy affordable food for the US consumer. If HSUS gets their way and eliminate the use of individual stalls, food will become more expensive than it is today. Our industries need to work together to eliminate the misconseptions that HSUS and others put forward. You have made an excellent point and it makes for a nice tie in to animal research. Many people, even those of us in the field, forget that not all animal research is dedicated to improving human causes. At land grant universities such as Penn State, there is a lot of research in agricultural animals to improve diets, housing, medical treatments, etc. I think you’re absolutely right that we have to join forces to work against groups such as HSUS and PETA and to show that what we do has a wide range of applications. Thanks for your reply.